Well after 2.5 inches of rain yesterday afternoon and evening at our house, my wife should not have to water the garden tonight. I had wanted a little bit of rain to keep the crop moving forward but I received a lot more than that. Last week we looked at a lot of corn that was V2 to V4. This week is critical in field corn. The weeds need to be cleaned up and a residual product laid down to keep the field clean until canopy. An example of a recipe you could use in glyphosate tolerant corn would be 24oz of a 5# glyphosate, 1.5pts Atrazine 4L (if you are not in a restricted area & you have not already used Atrazine), and 2 to 3 oz. of Capreno. Remember to always check labels and check with your Agronomist at Allied before making any applications. Now is the perfect time to call us to have your tissue samples taken for field corn. We want them pulled at V4 to V5 to confirm where the nutrient levels are at in the corn plant. We have many interns and staff available to help in this effort. We will also ask when the last time you pulled a soil sample. If it has been more than 3 years we will want to pull a soil sample at the same time the tissue sample is pulled. Please take the time with the weather delays to check on your corn stands (see pictures below). Check populations, look for missing plants, find out why they are missing. 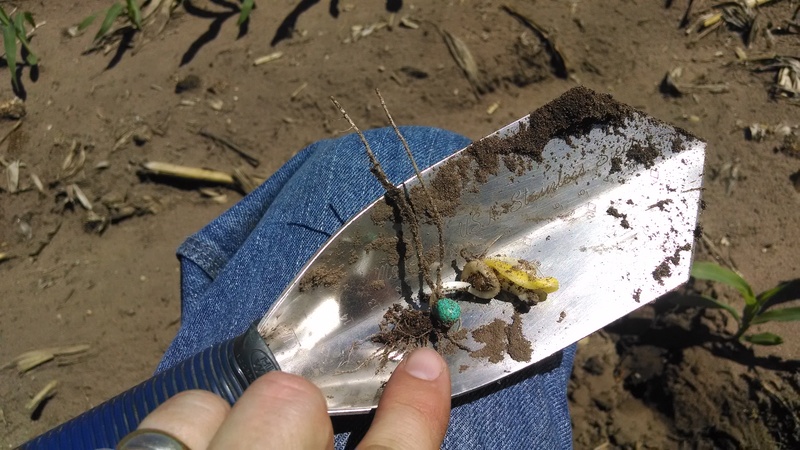 Bring along a shovel and check planting depth and look for any disease or insect pressure. If you do not have time please give us a call we would like to help you evaluate your fields.